"For 17 days I travelled solo around the entire island shooting almost 24 hours, sleeping in the car, and eating whenever I had the time. During my days shooting this film I shot 38,000 images, travelled some 2900 miles, and saw some of the most amazing, beautiful, and indescribable landscapes on the planet. Iceland is absolutely one of the most beautiful and unusual places you could ever imagine. Especially during the Midnight Sun when the quality of light hitting the landscape is very unusual, and very spectacular. Iceland is a landscape photographers paradise and playground, and should be number 1 on every photographers must visit list. Iceland during the Midnight Sun is in sort of a permanent state of sunset. The sun never full sets and travels horizontally across the horizon throughout the night, as can be seen in the opening shot and at the :51 second mark in the video. During the Arctic summer, sunset was at midnight and sunrise was at 3am. The Arctic summer sun provided 24 hours a day of light, with as much as 6 hours daily of "Golden light". Once the sun had set it wouldn't even get dark enough for the stars to come out, and they don't start to reappear until August. You MUST visit Iceland sometime during your lifetime. Tom Hanks contemplates "Wilson" the volleyball, his sole companion after being stranded on a desert island in the movie "Cast Away." The European Space Agency, using its expertise probing deep space to pierce the darkness of the seas, has developed a wearable antenna -- essentially a bat signal designed to enable search and rescue at sea. a new antenna communicates with satellites to pinpoint the coordinates of those lost at sea. the cloth antenna can be sewn onto lifejackets or uniforms of military personel. Finnish defense company Patria and Tampere University of Technology worked with ESA to apply its space know-how to dramatically reduce the time it takes for a distress signal to be picked up, for rescue authorities to be alerted, and for help to reach a man overboard, shipwrecked or otherwise lost at sea. So how does this new bat signal work? Emergency radio beacons can be carried not only by ships and aircraft but also by people (where they become known in the business as "personal location beacons"). But unlike other transmitters and their long floppy antennas, the ESA's new invention resembles a small square of washcloth. There's a reason for that: This antenna can be handily sewn into a life vest. When someone is lost at sea, the distress transmitter connects with the Cospas-Sarsat Search and Rescue system -- satellites in space that listen around the clock for activated beacons in the 406 – 406.1 MHz frequency band. The beacon transmits a distress signal with the exact coordinates of the person in distress to these satellites, and they notify mission control and coordination centers that a rescue is needed. In a great example of international cooperation, four countries -- the U.S., Canada, Russia and France -- came together to sponsor this satellite system. Cospas-Sarsat provides worldwide coverage for search and rescue; it's been instrumental in rescuing at least 26,000 since it was established in 1979. Traditionally, life vests equipped with Cospas-Sarsat transmitters relied on cumbersome and unwieldy whip antennas that restricted a wearer's movement -- which is hardly ideal when you're trying to stay alive out at sea. The lower the frequency, the larger an antenna tends to be. And the operating frequency bands for the Cospas-Sarsat are very, very low, making the challenge of creating a small, wearable antenna fit for search-and-rescue a difficult task. Since it operates at VHF/UHF band, free space wavelengths are approximately 2.3 to 8.2 feet. To fit in a life vest, the antenna needed to be miniaturized while keeping gain, bandwidth and effectiveness to make sure the satellite system could "hear" the call for help. There's an additional problem: Closeness to the human body can cause antenna effectiveness to be eroded and the radiation pattern to be disrupted. That's clearly a challenge if you're trying to design a wearable antenna, but it's one that this international team has managed to crack. Capable of withstanding the rough conditions at sea and direct contact with salt, this lightweight, flexible, water-resistant antenna is integrated into the life vest. When the vest is deflated, the wearable antenna can be fitted inside the cover fabric and the small Cospas-Sarsat transmitter into the cover pouch. But one challenge remains: If the sewn-in antenna is submerged, the connection to the Cospas-Sarsat satellite is lost. And when someone is battling to stay alive in rough seas, the life vest may end up in all sorts of positions, whether floating or swimming, that may arrest the beacon's effectiveness. Fortunately, there's an easy solution: sew several wearable antennae into different positions in the life vest to ensure the distress call gets out to the satellite system. While a wearable antenna designed for 243 MHz (the military frequency band) wasn't part of this project, a larger one for local homing targeting 121.5 MHz and one smaller for the 406-406.1 MHz were able to reach those satellites. Also very cool, the ESA has developed an attachable one for the Suunto diving vest, specifically for divers lost at sea. Davy Jones' locker might get a lot emptier in the future. The Benjamin Franklin Awards have long been recognized as one of the most prestigious independent publishing awards in the world. Previously, no book about fish or fishing had achieved this distinction. The award-winning book is loaded with interesting facts and information for tarpon anglers, marine scientists and conservationists concerned with the future of the remarkably migratory species. In a series of long-format interviews, longtime anglers and fishing guides share their experiences with and insights on tarpon. Their fascinating stories accompanied by rare black-and-white legacy photos spectacular color photography of leaping tarpon by Pat Ford. In great detail but easily understood language, he discusses the life history, population dynamics, migrations and spawning of this ecologically and economically valuable wild resource. Ault also discusses fishing impacts and threats to resource sustainability, and how better knowledge of the science by anglers is critical to sustaining tarpon fisheries. Sport fishing for tarpon is a $6 billion industry in the United States alone. Understanding a singular fish driving this magnitude of economic value and employing 100,000 people is crucial to maintaining a healthy resource for all to enjoy. “Tarpon are extremely vulnerable to even low levels of fishing due to their lengthy life cycle, similar to any other animal that grows to be substantial in size,” said Ault. Conservation of tarpon and other sport fisheries are a source of increasing concern to all who care about healthy oceans and critical estuaries throughout the Caribbean. “This important new book, besides being visually stunning and a fascinating read, is an excellent resource to educate anglers and policymakers on a global scale, we hope helping to guide legislation and sound management supporting their conservation for future generations,” Ault added. 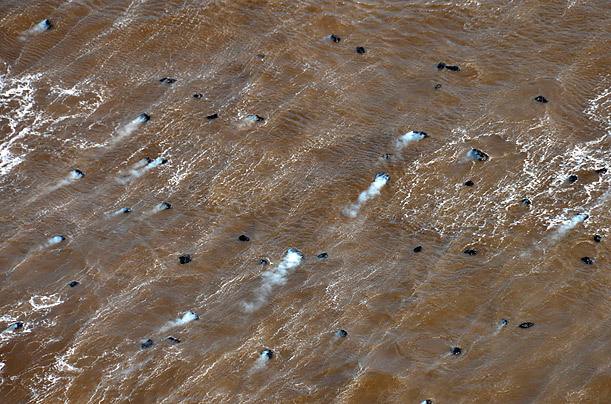 Whitecaps churn in the Atlantic off West Africa as an underwater volcano erupts off Spain's Canary Islands (October 11th). Since last week, the volcano has been spewing gas and fragments of smoking lava, staining the ocean surface green and brown, as seen above. 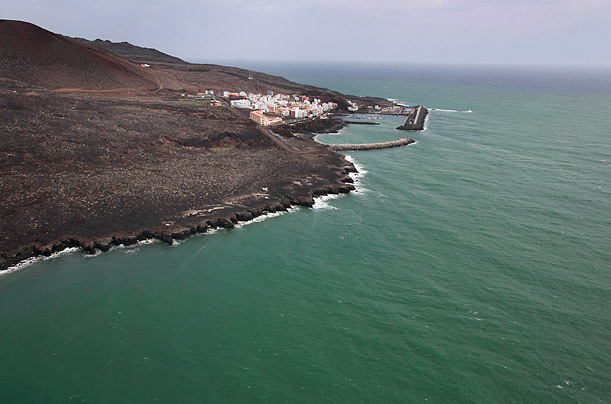 Spanish authorities have closed a port on Hierro island, ordered ships away from the island's village of La Restinga, and banned aircraft from flying over the island's southern tip, according to the AFP news service. Six hundred residents living at the port were evacuated. 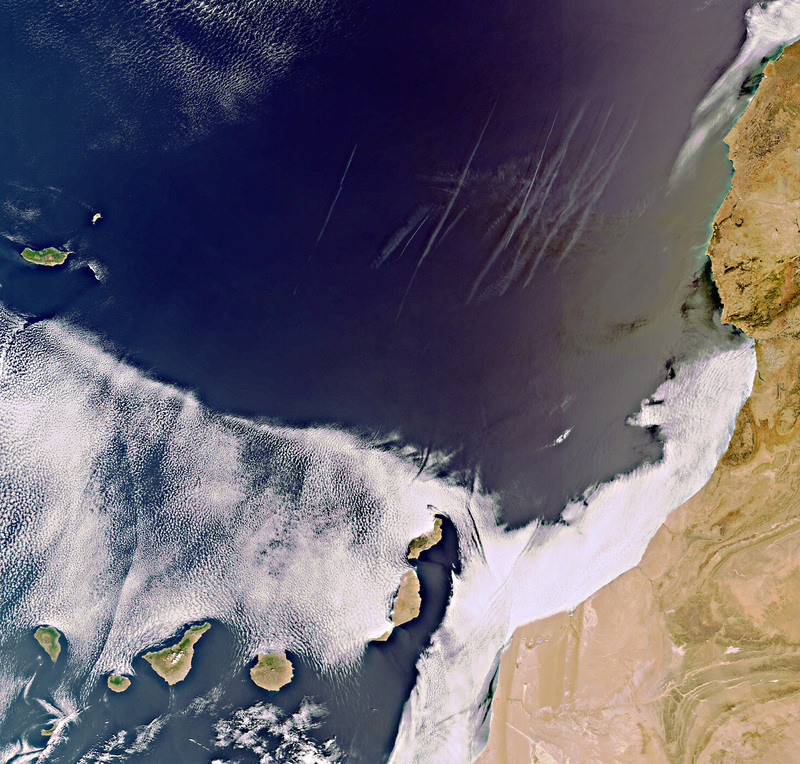 Erupting lava and gas caused a turquoise stain that spread across the surface of the Atlantic Ocean off Hierro island, as seen in an October 10 satellite image. The underwater volcano has been erupting at a depth of about 3,900 feet (1,200 meters). The Atlantic turns lime green as lava and gas billow from an underwater volcano off the coast of Hierro island on Monday 17th. About 10,000 earthquakes have hit Hierro, the smallest of the Canary Islands, since July 19-a sign of the volcano's rising magma, according to the European Pressphoto news agency. Some areas where researchers found significant concentrations of microplastic. Over the last decade, scientists have become increasingly alarmed about a type of pollution that cannot be seen. Micrometer-size fragments of plastics like acrylic, polyethylene, polypropylene, polyamide and polyester have contaminated the surface waters of the northeast Atlantic as well as shoreline habitats in Britain, Singapore and India, the researchers write. Researchers found that the proportions of synthetic fibers in marine sediments were akin to those found in artificial textiles. Examining washing-machine waste water, they found that 1,900 fibers can rinse off a single garment during a wash cycle and that those fibers look just like the microplastic debris on shorelines. Frothy water surges on a Netherlands beach. Using the natural luminosity of sand grains, researchers have discovered that a record-breaking flood hit the Dutch coast in either 1775 or 1776. The finding reveals a new way to look back in time at extreme weather events. Measurements of floods, storm surges and other phenomena didn't begin in earnest until the late 1800s. That makes it hard for scientists to track whether weather is becoming more severe, and it also makes it difficult to predict worst-case scenarios for an area. To go back further in time, researchers at the Delft University of Technology in the Netherlands examined a layer of beach dune sand exposed by a storm in 2007. They sampled buried sand grains from the layer and conducted an analysis called optical stimulated luminescence to find out how long ago the sand had been laid down. Optical stimulated luminescence takes advantage of the fact that low levels of background radiation are everywhere. Sediment absorbs this radiation, but when sand is exposed to the sun, that radiation "leaks" out, resetting the radiation level to zero. Using a special light wavelength, researchers can stimulate similar radiation "leaks" in the lab, measuring how much radiation comes out of the sand grains over time. The result is a measurement of how long it's been since the sediment last saw sunlight. A devastating flood in the Netherlands in 1953, caused by storm surge. The 1700s storm was a record-breaker: It dwarfed the largest flood on record in the Netherlands, the researchers report in the November issue of the journal Geology. That flood took place in the winter of 1953, caused by an 18.4-foot (5.6-meter) storm surge in the North Sea. Nearly 2,000 people died in the Netherlands, and several hundred more drowned in England and Belgium, because of that storm. The find is no guarantee that another giant storm surge is due, but it does reveal the potential for disaster in low-lying coastal areas of Europe. The researchers hope to use the sand technique to understand storm surge risks across coastal regions.